Mir Abdul Hanan scored the only goal of the match as Jammu & Kashmir edged past Uttarakhand in the Santosh Trophy North Zone Qualifiers Group B match played at MLSM College Ground, Sundernagar Himachal Pradesh earlier today. 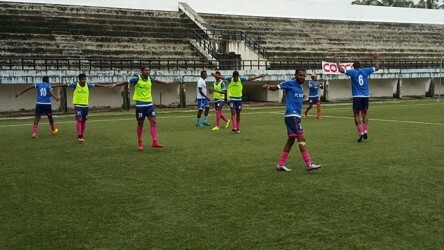 Uttarakhand coach Arun Negi made two changes to his side which lost to group favourites Punjab as defender Devesh Sajwan and goalkeeper Nitesh Dhek replaced Subham Rawat and Vipin Singh respectively. While J & K tactician Hilal Rasool Parray also changed his shot-stopper as Safiz Riyaz was guarding his side’s goal. He also gave a start to defender Nainjot Singh replacing forward Karun Raina, making it a strong defence as a defensive error in the last match against Haryana caused them to lose two points. The match started on with attacking football from J & K. It was just three minutes on the match clock when they scored the opening goal of the match. Hanan was brought down in the danger box by Uttarakhand defender Anuj Negi. 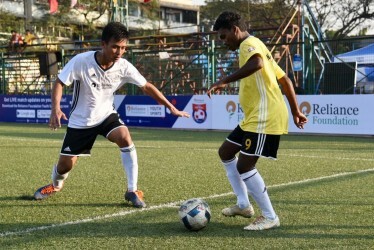 The referee Williams Koshy quickly pointed towards the penalty spot. Hanan sent Uttarakhand keeper Nitesh the wrong way and took his side into an early lead. Uttarakhand regrouped and came out all attacking. They had almost scored the equaliser when Anuj Rawat tried his luck from distance only to see it go wide by inches. A few minutes later, Uttarakhand’s Lalit Tariyal sent a perfect cross in the box but there was no one present in the box from his side to connect the same with every opponent beaten. 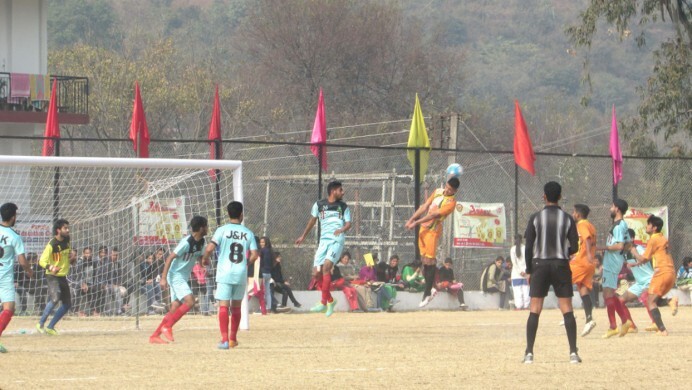 However, J & K almost scored an own goal when Ubaid Haroon’s header was going towards his own goal but Mohhammad Asrar Rehbar cleared it on time. In the last few minutes of the first session, J & K came up with a series of attacks. In one of these, Hanan’s header from close was fantastically cleared by Uttarakhand keeper Nitesh at the cost of a corner. In a dull second half, both sides showed a lack of quality football. 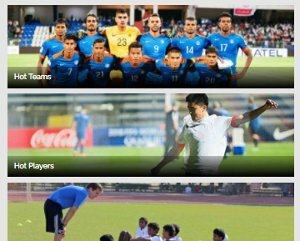 However, Uttarakhand created some chances to equalise but every time failed in the final third. First, Anuj failed to connect his header from close off Raja Rawat’s cross from the right. Later, Anuj was the culprit again when his weak header was easily collected by J & K keeper Safiz. In the dying minutes, J & K came close scoring when Amanjot Singh tried his luck from distance but keeper Nitesh made diving efforts to block his powerful shot. Uttarakhand custodian Nitesh was in action again when he made no mistake to intercept Shahnawaz Bashir’s cross in the box when he was trying to setup Rehbar. Uttarakhand went all out attacking in added time but J & K defender made no mistake to clear every danger from opponents. In Day 3's second match, Punjab secured a narrow 1-0 win over Haryana. 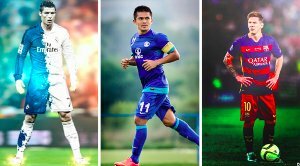 The match witnessed an end-to-end affair from the kick-off but as it progressed, the match was restricted to midfield play and both the teams went into the break goalless. However, Punjab broke the deadlock just after changing sides. Baltej Singh made no mistake to tap the ball home from point-blank range after Haryana keeper Ravit Balhara failed to clear Harshdeep Singh’s superb cross from the left. The last few minutes were intense as Haryana tried hard to find the equaliser but every time failed to do so. Just before the full-time whistle, referee Ramaswamy Coimbatore sent off Punjab defender Manpreet Singh for elbowing a Haryana player. With two wins Punjab top Group B with 6 points, while J & K and Haryana stand second and third with 4 and 1 point respectively. Report by Khel Now Correspondent Ravish Narvekar from Goa. A true Football enthusiast & a diehard Liverpool fan. Ravish also enjoys travelling & he's an avid foodie.